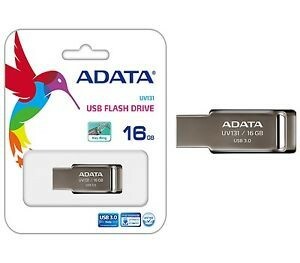 Forget the hassle of flash drive caps, presenting the all new Adata USB 3.0 Flash drive with push slider design. The body features a fingerprint proof finish which unlike most other model flash drives resists from fingerprints. The small form factor of Adata USB 3.0 Flash drive makes it ideal for easy transportation and OTG with wire platforms. This flash drive comes in multiple storage models including 8GB, 16GB, 32GB, 64GB and 128GB versions. A Step up from the 2.0 USB, get the super fast portable USB 3.0 Flash Drives capable of Data transfer speeds up to 90MB/sec. Multiple options available.